Tessa Gray should be happy - aren't all brides happy? Yet as she prepares for her wedding, a net of shadows begins to tighten around the Shadowhunters of the London Institute. This is my most anticipated book of the year. I was been impatiently waiting for the conclusion to this amazing story. I had in my mind what I thought would happen but I knew in true Cassandra Clare fashion there would many surprises along the way. Narrator Daniel Sharman's voice is...perfect. I love a good English accent. I couldn't wait to listen to more just to hear his voice. I found myself trying to find chores to do just so I could listen to more. He is easy on the ears that's for sure! After I finished this audio, I went straight to find if he'd done more. I want more of Daniel Sharman's voice! I'm so enamored by the Shadowhunter world. If this series never ended I'd be happy. I'm crazy over the time period, costume's and this is a love triangle done right. I loved both Will and Jem and I wanted them both to be happy, I just didn't know how it could possibly happen. I'm not a spoilery person, so I don't feel like I can talk about the book in any detail without giving something away so I won't even try. I'm just going to say that I loved this book. I loved every single page. It is the most beautiful book on friendship I have ever read. Everything ended as it should. Nothing was lacking. My heart was full. There was plenty of passion and adventure to keep me gripped throughout the whole book. This is a series that I will re-read over and over again. The good guys win, you know. And by saying that, I’m not giving anything away. Because let’s face it, we all know, in our heart of hearts, what is going to happen. This series is a prequel and we already know that the good guys have to triumph in order for The Mortal Instruments series to even exist. So let’s just level, here: Everything you expect to happen, does. But here’s the exciting part: NOTHING HAPPENS IN THE WAY YOU’D EXPECT IT TO. And that, friends, is good storytelling. But the heart of any good book is in the details. And the details of this book!!! Oh my!! I finished this book in tears. I was a puddle; a big, gooey, happy, sobbing puddle. Because everything was addressed, everything was answered and everything was just perfect in ways that I would never have imagined. Not that everything was all marshmallows and cream-puffs. Nothing truly good happens without the bad happening right alongside it. The hard stuff makes us value the good stuff. Jane Austen once said, “My characters shall have, after a little trouble, all that they desire.” In a way, I think Cassandra Clare must have been channeling good ol’ Jane when writing this book. 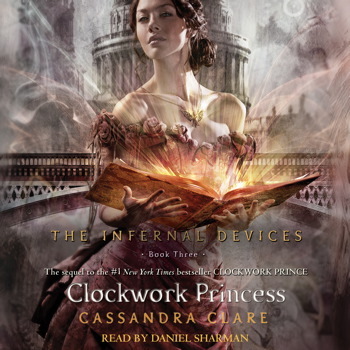 Cassandra Clare has outdone herself with this book. It is a masterpiece in the Shadowhunter stories library. You make me *almost* want to give this series another try. (Although the first four tries were not successful, so I've just written this off as "not my cup of tea"...) I'm glad you found it satisfying as far as the series goes and that you (and everyone else) really seems to enjoy it! OK, this series is my JAM!!! I love it more than The Mortal Instruments. Way more... it speaks to me. I've been putting off buying this as I have way too many books on my bookshelf to read but now I'm really intregued, loved the Jane Austen quote too!